Provide comfort for the family of Arlo VanHouten with a meaningful gesture of sympathy. 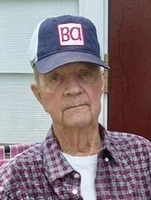 Arlo Lee VanHouten, age 91 of Middleville, passed away peacefully March 28, 2019 at his residence. Arlo was born June 4, 1927 in Lake Odessa, the son of Merle and Gertrude (Kauffman) VanHouten. A veteran, Arlo proudly served his country in the United States Navy during WWII. Later, he was employed by LW Lamb for over thirty years before retiring in 1992. Arlo was an avid horse racing fan, watching horse races and travelling to different race tracks. He also enjoyed going on fishing trips, golfing, crossword puzzles, jigsaw puzzles, reading and gardening. He was a huge sports fan, especially Tigers baseball, he could often be found in his garage listening to the games. Arlo had an amazing memory and sense of humor, he lived by his motto “you need to have humor in your life.” Arlo is survived by daughters: Connie VanHouten and Carla (Stanley) Root; son: Craig (Kathy) VanHouten; grandchildren: Tami (Randall) Binkowski and Brandon (Colleen) VanHouten; great grandchildren: Mya, Ryan, Audrey, Levi, Luke (Meghan), Alex (Aubry), and Ryan; and several nieces and nephews. Arlo was preceded in death by his parents; wife, Frances (Guthrey) VanHouten; a grandson, Jason Miller; and brothers: Trevor VanHouten, Jack VanHouten, and Gary M. VanHouten. Per Mr. VanHouten's wishes, cremation has taken place. Private burial at Mount Hope Cemetery with full military honors by American Legion Post 45 will take place at a later date. Memorial contributions to Faith Hospice will be appreciated. Please visit www.beelergoresfuneral.com to share a memory or to leave a condolence message for Arlo’s family. To send flowers in memory of Arlo L. VanHouten, please visit our Heartfelt Sympathies Store. A private graveside service with full military honors by American Legion Post 45 will be conducted at a later date. We encourage you to share your most beloved memories of Arlo here, so that the family and other loved ones can always see it. You can upload cherished photographs, or share your favorite stories, and can even comment on those shared by others.